A beautiful mid-century modern home—a bauhaus construction built in 1937—which is set in a wooded area with river views. 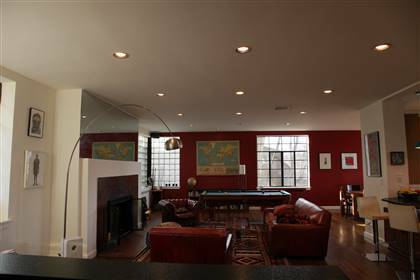 The spacious living/dining area has large casement windows and opens onto a deck with a built-in hot tub. There is also a stunning vaulted stairwell, 5 bedrooms, including a large master bedroom with a private balcony (also with river views). Property also includes sauna, large family room, large lower deck, spacious lawn and garden. House is located at the end of a dead end street and is quiet and secluded. Hastings-on-Hudson is only a 31-minute train ride from Grand Central Station or a 45-minute drive from Midtown Manhattan.